I know you are all dying to find out more about the magazine and when it will be launched. I am working all out to get it finished by the end of next week. There are so many contributions and working out how to format them to present them in the best way is taking longer than I had expected. I thought I would share with you a sneak peek of one submission I had received. Cesar is the man behind the blog Cocktail Tendenciero and is also a contributor for the magazine. 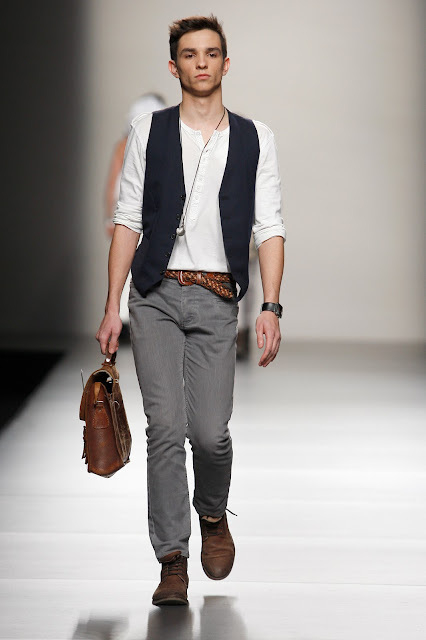 Not only this, but he has also walked on the catwalk during Madrid Fashion Week. This new beginning is documented in an article in the magazine along with a gorgeous photo of his moment of fame. I thought I would share with you this video of the catwalk show so that the event is brought to life for you. Cesar entered a competition called "Cool People in Cibeles" to become a model for the day during Madrid Fashion week. He uploaded a look of himself to facebook and he had gained enough votes to enable him to become part of the team for the day. After spending the day in rehearsals and make up, he finally had his moment of fame. Can you spot which one he is?